Need inspiration for your own renovation project? Or simply fancy having a look around a gorgeous period property? This rural cottage is one of our favourites. Read on to find out how its owners went about rescuing it from the brink of dereliction and then gave it an elegant new look, then browse the rest of our real home transformations. Read our guide on renovating a house, too, for more guidance. 'Stand still long enough and you’ll get painted in this house,’ jokes Wendy Blakeman. There has been no danger of that, though, for Wendy and her husband Peter – since buying the 240-year-old farmhouse, they haven’t stood still for a minute. In a whirlwind few years, the couple brought the house back to life from near dereliction, added a small two-storey extension and turned over an acre of rough farmland into a series of stunning garden vistas, complete with two summerhouses and views of Derbyshire’s Peak District. Built in 1772 and bought by Queen Victoria in 1890, the property’s royal connections meant that before the Blakemans could get their hands on the keys, the sale had to be approved by the Duchy of Lancaster, the main landowner in the area. As the property had been empty for two years before they bought it in 2005, and was lived in by tenants for more than 100 years before that, there was certainly a lot to tackle. In fact, for the first six months after buying the farmhouse, Peter did go out to work every day – not in the record store he’d once owned, but at the house itself. He and Wendy worked from 8am until 6pm alongside the local builder, returning exhausted each night to the house they were renting until their new home was habitable. The house was rewired and damp-proofed, rotten windows were renovated and occasionally repositioned, but never discarded. Peter project-managed the whole operation, pitching in where he could – knocking walls down, putting walls up, sandblasting the black beams and plasterboarding between them. In the snug at the side of the house, the lath and gypsum floor had completely rotted away and you could see right down to the cellar. Undaunted, and asking the builder for advice when he got stuck, Peter replaced the floor, built a fireplace with bricks they’d found in the garden, and added alcove shelving. Six months later, with the essential repairs almost complete, the couple were at last able to move in. Work then began on a small two-storey side extension to the property to house a garden room, breakfast room and upstairs bathroom. 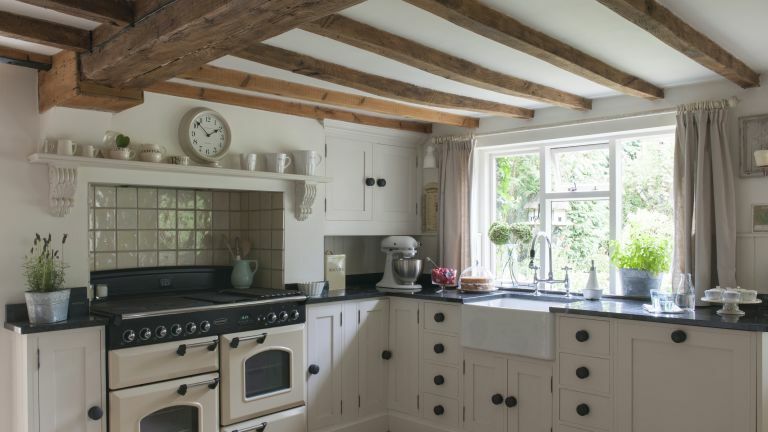 Tongue-and-groove panelling, painted in Farrow & Ball’s New White, is the perfect complement to the handmade Shaker-style kitchen cupboards, along with contrasting granite worktops. Wendy decided that the kitchen would work best without a table, so the round table in the breakfast room is where Peter and Wendy eat. Here, Peter made the doors for the dresser top, which Wendy then painted, and travertine flooring is used in the hall, kitchen and breakfast room to link the newly built section to the oldest part of the house. Farrow & Ball’s Pointing, a gentle off-white, is used on every wall – Wendy’s philosophy being that ‘with a neutral base you can just add a colour and change the look’. If she did fancy a splash of colour, however, Wendy could simply step outside to the barn and choose from the piles of cushions stored there. ‘I have an illness,’ she confesses. ‘Cushion-itus. I have hundreds of them.’ Wendy never buys cushions, making them instead in Kate Forman and Cabbage & Rosesfabrics or, in the case of those in the breakfast room, using printed tea towels from Thornback & Peel. When the couple finally turned their attention to the garden, it really was a blank canvas. What do you do with over an acre of rough scrubland? The answer, according to Peter and Wendy, is plant 120 saplings and a small topiary garden, pack your flower borders with so many plants that the weeds don’t get chance to grow, then put up two summerhouses. Latte Lodge, the garden cabin where Wendy likes to sit and sew or chat to friends over a coffee, is an impressive space, with views right across the Derbyshire hills. Inside, in keeping with the shabby chic theme, there’s a comfy sofa, a dressing table overflowing with textiles and lace, and Peter installed a log burner so they can enjoy the summerhouse all year round. At the other side of the garden, Gull Cottage was a small tool shed that friends were throwing out, but Wendy has turned it into her very own Southwold beach hut with seemingly effortless inspiration. Shells, seaside accessories and bric-a-brac were sourced on the couple’s frequent trips to the Suffolk coast and to her all-time favourite shop, Tinkers in Walberswick, which she says is a ‘treasure trove of vintage finds’. With the lids firmly back on the paint pots and the house now looking so well cared for, Wendy feels a great sense of satisfaction with what she and Peter have achieved. ‘I like it to look as if it’s all been lived in,’ she says of their cottage. I’ve always bought houses that needed love, and I try to keep the character as well – I think that’s the most important thing.’ Surely, even their Majesties Victoria and Elizabeth would have to agree.